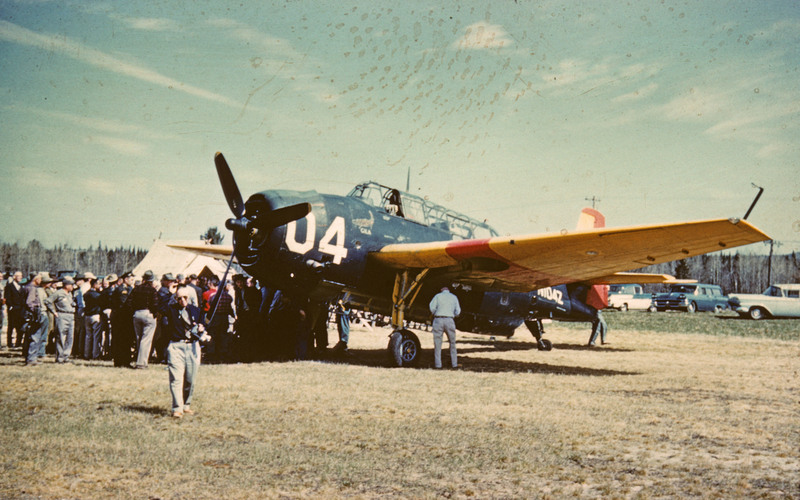 This is a history of Forest Protection Limited’s (FPL’s) association with some 88 TBM Avenger aircraft used in the spruce budworm aerial spray program, primarily in the province of New Brunswick, Canada. This text has been compiled from many sources. From the late 1950s to the early 1980s, Avengers were contracted by FPL from all over Canada the western United States. FPL purchased many of those same Avengers in the establishment of its own fleet, which at one time had the most working Avengers flying at any one time in the World. Although FPL’s Avengers were gradually replaced by the AT803, they continued to be used as fire bombers well into the 2000s. The last Avenger left FPL in 2012. The TBM-3E Avenger is a rare aircraft. Approximately 40 are currently airworthy in the world, 27 are on display, and 14 are in storage or undergoing restoration from a total of 9,389 manufactured for WWII. Avengers participated in all major engagements of the U.S. Navy starting with the Battle of Midway. It was utilized in anti-submarine patrol, search and rescue, and airborne early warning. A large, heavy but versatile and easy-to-fly aircraft, it can attain 267 mph and 1900 horsepower. While primarily designed as a torpedo bomber, its large weapons bay and capability to handle ordnance on its wings allowed it to perform level bombing, dive bombing, and rocket attacks. Declared surplus in 1960, many TBM’s carried on in civilian life as sprayers and fire suppression air tankers. The large bomb bay was adapted to hold a 500 Imperial gallon tank. 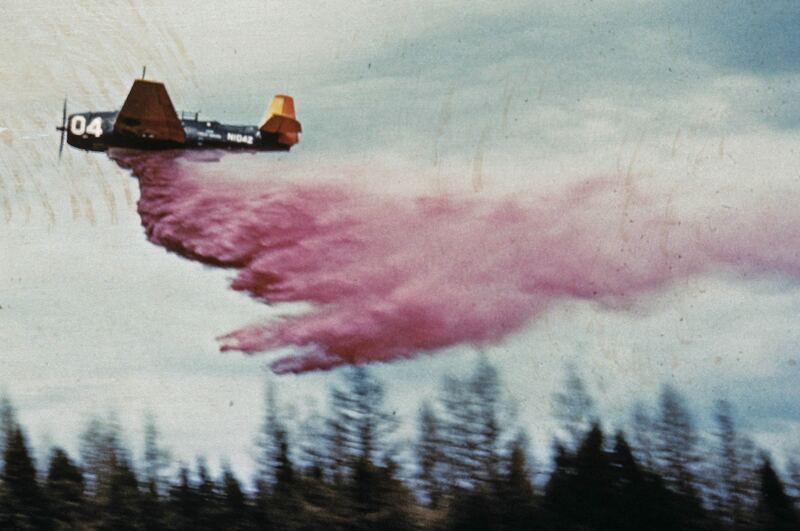 The retardant delivery system had a capacity of 500 Imperial gallons in 2 compartments. The pilot can select full 500 gallon drop, 2 single drops of 250 gallons each or staggered drop with delay set as desired, depending on coverage desired and fuel type involved. Drop speed is 110 knots and drop altitude is approximately 100 ft above forest canopy. Retardant is a clay-fertilizer-water mixture that fireproofs unburned fuels and is used to contain a forest fire rather than smother it. Reload is land-based from satellite airstrips with retardant storage throughout the province. The TBM carried four times the payload at about 80% greater speed and with an operating range of about double that of a Stearman. This resulted in fewer personnel and about half the airstrips required by the Stearmans. The forest area requiring treatment was generally large and continuous, and did not require the more maneuverable Stearman, which were more suitable for small isolated treatment areas. 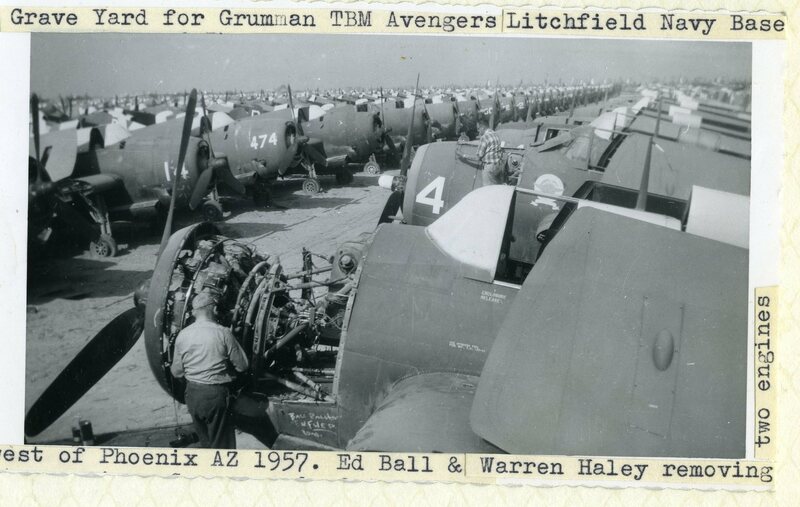 The US Navy operated a Naval Air Station in Litchfield Park, Arizona from the WWII era into the late 1950’s. 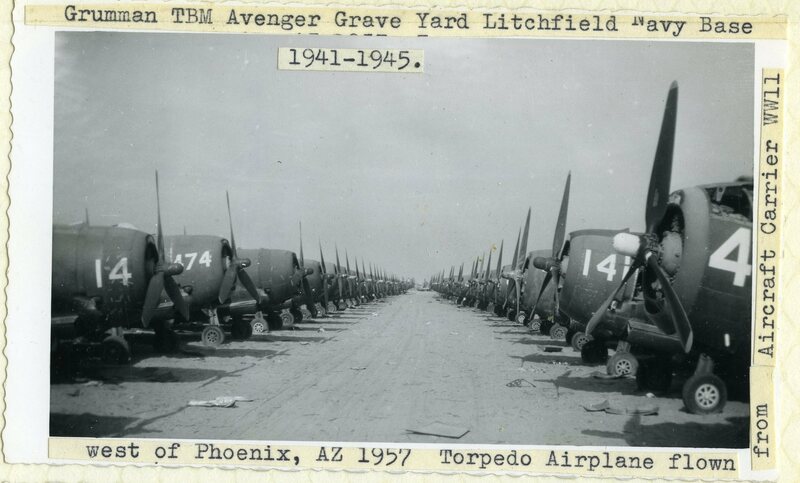 After WWII, thousands of surplus aircraft, including Avengers, were stored at Litchfield Park, sometimes called the Litchfield Plane Boneyard. Many of these aircraft were put back into service to meet the demands of the Korean War. Those that were not simply sat out in the dry hot climate for many years. A decision was made to close the facility in the late 1950s. The aircraft that remained were either sold off, moved elsewhere, or were smelted on-site. It took years to either sell or recycle all of the WWII aircraft. This image was provided by Norm Ralston of Hilsboro, Oregon, whose father “Swede” Ralston purchased one of the first Avengers for spraying in the USA. Here, Ed Ball and Warren Haley are removing engines from two TBMs. Same source as above, taken by “Swede” Ralston from the same spot as above. The USDA Forestry Service (USFS) received eight surplus TBM-3U’s in 1956 for borate bomber development (Larkins and Turner 2011, Warbirds International). These were registered as N102Z, N103Z, N104Z, N105Z, N106Z, N107Z, N108Z, and N109Z. The first time that TBMs were used in Canada for forest spraying operations was in British Columbia (BC) in 1957 (see Lejeune 1975). Four US-registered TBMs were leased from US contractors by Skyway Air Services of Langley, BC, to spray for Western Black-headed Budworm. At this time (May/June), Skyways owned several Stearmans (some of which had traveled to NB since 1952), but they had been contracted to FPL to spray for spruce budworm in NB. With the availability of surplus TBMs from the Royal Canadian Navy (RCN) and with favourable performance reports as sprayers and water bombers in the US, Canadian contractors bought 15 TBMs in 1958. The decision to introduce TBMs into the NB spray program was not done without knowledge of their ability as sprayers in Canada. Below is a list of 81 Avenger airframes that survived US military service as presented in the Warbird Registry’s pages. An additional 78 TBMs not associated with the FPL spray program also survived military service. In many cases this author has updated the Registry with information from this project. STATUS: A = Airworthy; C – Scrapped; D = Display; R = Restoration; S = Stored; W = Wrecked; ? = Unknown; numeral = year of latest information. I want to buy a throttle to a Grumman Avenger. Any one know where and how much or have one they want to part with. Anyone remember my step grandfather Jan Falkowski? He flew these TBMs and in 1973 when I visited Canada took me to see them at one of the fields they were based at. He lived in Uxbridge and was usually the CFI at Markham Airport outside Toronto. Good to know that your TBM is still flying, many of us still love those old birds. Where do you live? The stated never exceed speed as listed on the type certificate is 355 MPH. Sorry about the late reply Chris. I just noticed that there was this enquiry. No, I am still trying to learn whether 7922A was removed from its crash site or whether it was rebuilt. If I knew it was still in the brush I would attempt getting to it. I was hoping to pinpoint the crash location by possibly getting ahold of the pilot. I have talked with Don Henry but he was not sure whether it was ever resurrected. Tom Wilson has a lot to do with the past history of the TBMs. Let me know if you don’t have his contact numbers and I see if I can dig them up. It was Tom that gave me Don Henry’s numbers. If you are close to Don I would really like to know if the pilot is still around and how to contact him. I too am trying to track down a crash site. My father, Merrill McBride, lost his life in CF-ZTA near Sevogle in 1974. I have general coordinates from the accident report but would really like some solid info before making a trip. I was told by DNR that most of the TBM crash sites would have been removed or burried in the early 90’s after the spray program ended. They also told me to contact John Lavigne who may have been involved and I see some correspondence from him here too. Does anyone know if the wreck might still be there? I flew the TBM for several years both in Fire Bombing and the Budworm spray (1960 – 67). My new book Fire Bomber Into Hell…A story of survival in a deadly occupation, contains some of my adventures with the TBM.A visit to my website gives a brief introduction to the book. Is it possible that you can give your readers information about the availability of this book? A “must read” from Amazon! Your vivid descriptions of Fire Bombing and TBM flying truly enrich this great FPL history. I am looking for the crash report of N7922A where it went in near Chipman. I am hoping to get a closer idea of where it crashed in relation to the airport. I am still trying to determine the final resting place of 22A. Anyone out there have any information where I might go to to further my search?? Norm, did you ever get the info you were looking for on N7922A? There is someone I can contact here, Don Henry, if you want. That plane crash site brings back some memories. I remember when I was kid back in the late 1970’s or early 80’s at Camp Wegesegum (just west of the airstrip). The guide counselors took us on a field trip to see the plane crash site. It was within walking distance from the camp and somewhere in the woods on the west approach. I don’t know if it is still there. If you are still looking, i’m sure someone from the JD Irving Woodland Office in Chipman would be able to help you out.